It’s a very nice day that promises a good future for both countries,” said a smiling North Korean leader Kim Jong-un as he sat down for a meal with US Secretary of State Mike Pompeo at a welcome ­luncheon in Pyongyang on October 7, 2018. From October 5 to 8, Pompeo visited Japan, North Korea, South Korea and ­China. Before the luncheon, Pompeo went so far as to put his arm around Kim’s shoulder. It was the fourth time the US secretary of state ­visited Pyongyang this year. The previous time – after the Trump-Kim meeting in ­Singapore – he failed to even secure a meeting with the North Korean leader. 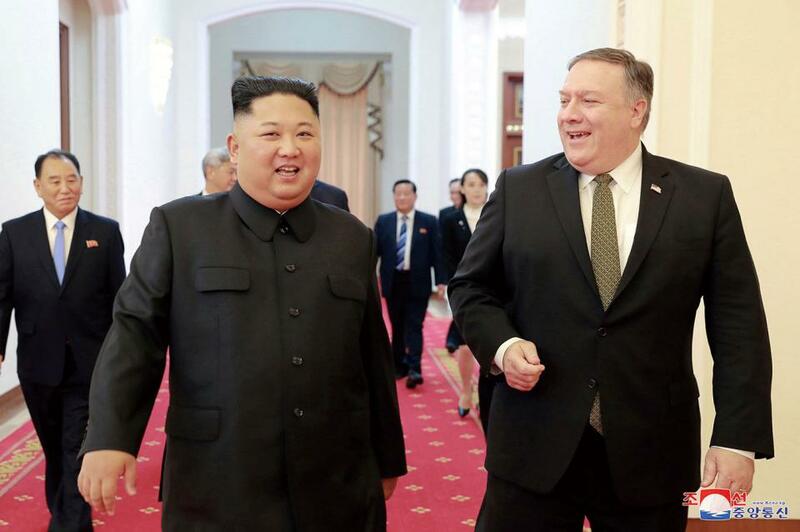 “We had a great, great visit this morning,” Pompeo responded. “President Trump sends his regards. And we had a very successful morning, so thank you.” According to US State Department spokeswoman Heather Nauert, the two discussed a time and place for the next summit between their nation’s leaders, and said that North Korea would ­allow international nuclear inspectors to enter the dismantled Punggye-ri nuclear test site to ensure it will never be used again. “Had a good trip to Pyongyang to meet with Chairman Kim. We continue to make progress on agreements made at Singapore Summit,” Pompeo later posted on his Twitter account. 18 and the release of a joint statement, the two nations have to date failed to resolve their disputes over the outcome of the historic talk. The US insisted that North Korea dismantle its nuclear programs before any further talks can be held but North Korea’s stance is that denuclearization measures and concessions will be matched “action for ­action.” The negotiations reached a deadlock. Pompeo originally planned to visit North Korea in late August 2018, but canceled the trip because Trump was dissatisfied with the progress of bilateral relations. On September 26, Pompeo held talks with North Korean Foreign Minister Ri Yong-ho in New York where he was attending the UN General Assembly. According to the US State Department, it was then that Pompeo accepted Kim’s invitation to visit North Korea. On October 2, US State Department spokeswoman Heather Nauert said during a routine press conference that Pompeo would visit North Korea for the fourth time within a year, which reflected the momentum of bilateral relations, as well as US determination to turn the consensus reached by leaders of the two sides into concrete action. Douglas H. Paal, vice president for studies at the Carnegie Endowment for ­International Peace, told NewsChina that the ­American people believe tensions are cooling down on the Korean Peninsula, making Trump feel that his personal political endeavors are widely supported and have yielded fruitful political results. Korea leaders’ meeting, he added, show the US is considering reaching a ­compromise with North Korea on the basis of the Pyongyang Joint Declaration – ­publication of an end of war statement in exchange for North Korea’s pledge to dismantle its ­nuclear ­facilities at Yongbyon, the nation’s major nuclear facility. On September 19, Kim Jong-un held his third talk with South Korean President Moon Jae-in, who visited Pyongyang for the first time. The two countries inked the Pyongyang Joint Declaration and reached agreements on the denuclearization of the Korean Peninsula, strengthening mutual communication and cooperation, and ­striving to bring permanent peace to the area. North Korea pledged that if the US takes measures as per the joint statement released after the Singapore Summit, North Korea will take action to permanently disable its ­nuclear facilities at Yongbyon. It also decided to permanently dismantle Tongchang-ri missile launch pad and the engine test site. According to the Blue House press secretary Yoon Young-chan, the Pyongyang Joint Declaration actually marked the end of the Korean War. When delivering a keynote speech during the 73rd UN General Assembly on September 26, Moon Jae-in mentioned the name Kim Jong-un eight times, saying that it was time for the international community to reward the choice and endeavor made by North Korea. In the opinion of Douglas H. Paal, South Korea has made a great contribution to the dynamic interaction between the US and North Korea. Paal argues Moon Jae-in has stressed the importance of establishing mutual trust between the US and North Korea. After the US and North Korea leaders’ meeting, ­negotiations over the denuclearization of the Korean Peninsula once again came to a standstill which forced members of both governments to rethink their communication tactics. Since the Pyeongchang Winter Olympics, North Korea has not launched any nuclear tests and the peninsula ­situation has eased. It is generally recognized that Moon Jae-in has played a very active role. On the other hand, skepticism toward Moon Jae-in’s actions also abounds, with some worrying the international community is likely to fall prey to a North Korean push to accept its nuclear status. During a UN general debate on ­September 29, North Korean Foreign Minister Ri Yong-ho argued that the North Korean leader has firm confidence in the ­denuclearization ­process, which will be successful as long as the US shows enough sincerity to win the trust of North Korea. Without trust, he ­added, North Korea could not be confident in its national security. Under such ­circumstances, North Korea would never demilitarize ­unilaterally. After Pompeo’s visit to North Korea, he arrived in Seoul on October 7 to meet and inform Moon of his activities in Pyongyang. According to a report by Yonhap News Agency, Moon said it was an important day for the three countries. The next day, Moon disclosed that Kim Jong-un would visit Russia, and Chinese President Xi Jinping was expected to visit North Korea, which was also expected to hold leaders’ talks with Japan. Yonhap commented that a new order is taking shape on the Peninsula. South Korea’s Unification Ministry spokesperson revealed on the same day that in order to implement the Pyongyang Joint Declaration, the North and South are considering holding high-level bilateral meetings. As the last stop on his four-nation tour, Pompeo arrived in Beijing on October 8. Analysts said the main goal of his visit to China was to win support from the nation to put pressure on Pyongyang and communicate about Sino-US relations amid the intensifying trade conflict and impasse. US President Donald Trump and Vice President Mike Pence have publicly criticized China for attempting to “interfere in the internal affairs of the US.” Meanwhile, the Trump Administration announced it had approved US$330 million in arms sales to Taiwan. Da Wei, a professor at the University of International Relations in Beijing, told NewsChina that even though disagreements and problems persist in Sino-US relations, the two countries have reached a consensus in resolving the North’s nuclear issue and ­easing tension on the Korean Peninsula. On October 5, Pompeo said publicly that though China and the US have ­disagreements, China has been supporting US efforts to talk with North Korea, adding that if a peace treaty is signed to end the war, China will be part of it. Chinese Foreign Minister Wang Yi said after meeting Pompeo in Beijing that China will support direct talks between the US and North Korea and is willing to play a unique and crucial role on the basis of mutual respect and catering to each other’s interests.